Le 4e Mur, Montreal’s first speakeasy bar of the 21st century (I guess there would have been some in the early 20th century) celebrated its first anniversary last July. Its opening in 2015 was announced Hollywood style with a mysterious black and white teaser introducing the five founders’ alter egos – Dr EDD, Dirty Diana, Miroslav, le Corse (the Corsican) and Père Denis (Father Denis) – as the prime suspects in a criminal investigation led by a private detective. 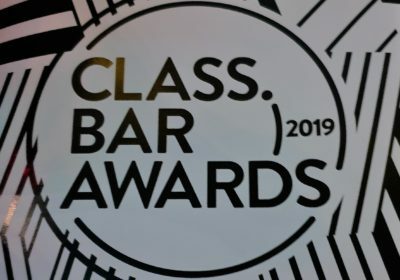 A second video was released in honor of the bar’s one year anniversary. Having met Dr EDD, aka Eddy, on a previous trip to Montreal I followed the adventures of Le 4e Mur on Facebook and through the bar’s newsletter. Needless to say I was extremely curious to visit it some day and jumped on the opportunity to do so in early August. 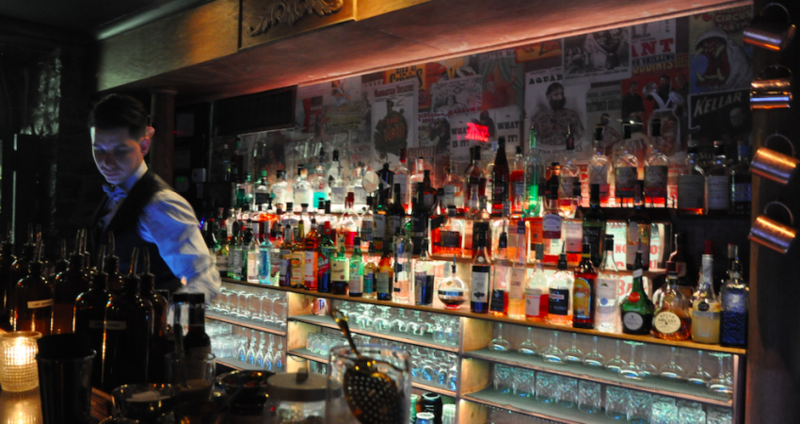 In true speakeasy style, Le 4e Mur keeps its address a secret. To obtain it, you’ll have to sign up on their website or ask someone in the know. If you register online, you will regularly receive newsletters informing you about the launch of a new menu, special events, masterclasses or guest bartending gigs. There will also be a cocktail recipe for you to reproduce back home. All I’ll say about Le 4e Mur’s location is that the neighbourhood is not a trendy neighbourhood per se. It’s busy, there are other venues nearby, but it doesn’t really come to mind as an area for elaborate cocktails. Not a problem for the bar’s founders, quite the opposite! 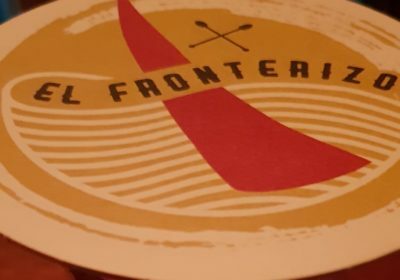 “Our goal is to turn the bar into a destination. People will come to Le 4e Mur specifically and not just go to the neighbourhood and happen to pass our door” Eddy explained when I visited. When you reach the address, the presence of a doorman standing in front of the glass door of a detective agency bearing Le 4e Mur’s logo will give away the bar’s location. (If you wonder why a detective agency, remember the investigation in the teaser video.) You’ll still have to use your wits to get inside though. See, as you pass the agency’s door, you’ll literally hit a wall. That’s when you’ll realize the genius behind the bar’s name. “Le 4e mur” is French for “the 4th wall”, a concept in theater designating the imaginary wall separating the audience from the actors. 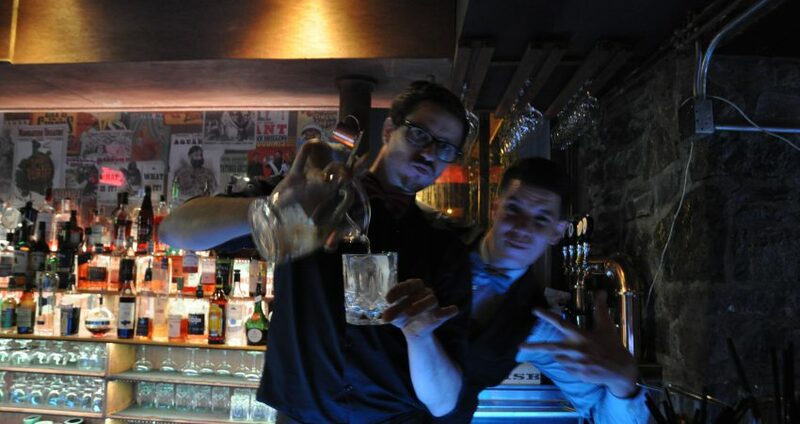 No separating guests from the bartenders here though! In fact, guests are figuratively invited to “break the fourth wall”, another theatrical expression used to describe the moment when actors acknowledge and engage with the audience. Back to the wall at the bar’s entrance. Don’t try to tear it down as many people have already tried before you. You’ll just damage the property and your hands. 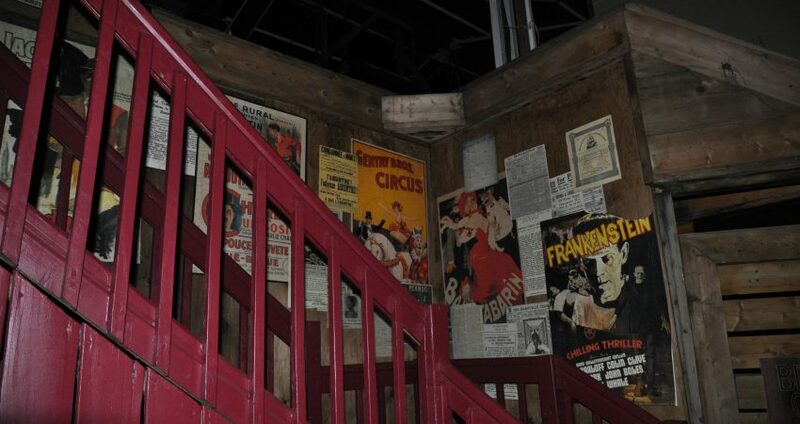 Look closely around you and you’ll figure out how to reveal the wooden stairway leading to the bar located below street level. Walk down, pass the curtains and step back in time, back to the Prohibition era, when bars were clandestine. The first sight that will greet you is the station with its high stools, its shelves of spirits with old posters behind and, last but not least, the bartenders, all very dapper with their long sleeve shirts, slacks and bow ties. While they stand behind their station, they will be attentive to your needs and the service will be caring and friendly. The wall has been broken, remember! You’ll be in excellent hands with your hosts. 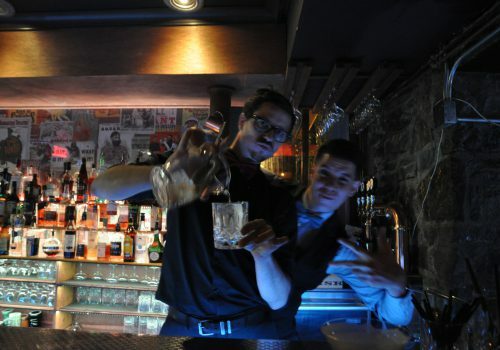 Before opening Le 4e Mur, they have collectively gathered experience in some of the best bars in France, Canada, Switzerland, Australia and other countries and have won several national cocktail competitions. Alexis, one of their latest additions whom I had the pleasure to meet, was crowned Meilleur Ouvrier de France 2015 in the bartending category. The MOF as it’s dubbed is the highest, most prestigious distinction awarded in the hospitality industry in France. Alexis also won the first place at the Diageo World Class France competition in 2012. Back to the bar. In terms of build and decoration, the exposed stone walls, wooden panelings, wallpaper covered walls and subdued lighting make for a cozy, refined atmosphere. A small alcove faces the bar. A group of 3-4 people can sit there and watch their cocktails being made from afar. Larger groups will be comfortably accommodated in one of the two booths in the second room, around which small tables are also scattered. The bar station extends to this back room. If you get to sit there, you’ll have a vantage point on both the drink preparation and the small scene where burlesque shows take place on Tuesdays and Saturdays and live bands play jazz (classic, acoustic, gypsy and New Orleans style) on Thursdays. “It was our wish to provide an atmosphere worthy of the 1920’s”, Eddy said. Finally, the back room’s emergency exit opens on an outdoor terrace, ideal to enjoy the warm summer evenings. Bound in a leather portfolio, each sheet of the menu is nicely illustrated by none other than Maxime, one of the bar owners! If memory serves right, it starts with the beer and wine menu. Then, a page of 4-5 cocktails per founder follows. Each list comprises either creations or twists on classic recipes. If you’re a group, you can also opt for one of the punches. 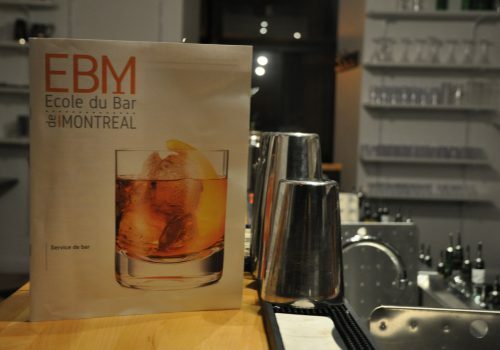 Finally, the menu gives an explanation about the 4th wall concept and introduces L’Ecole du Bar de Montréal, the bartending school opened by Le 4e Mur’s founders. I liked Le 4e Mur so much that I didn’t go once but twice on my two nights stay in Montreal. On my first night, I tried two of Dr EDD’s drinks. The Black Beast was a mix of pisco, merlot, rhum, lemon and lime juices, egg white and simple syrup. I love pisco and this drink was quite the wonder. The wine was a perfect compliment to the grape brandy and really brought up the fruit flavour. A very fine drink! Then I had a Hayden’s Basil, an excellent smokey cocktail. What can I say: I love my smokey drinks and Dr Edd’s concoction didn’t disappoint. 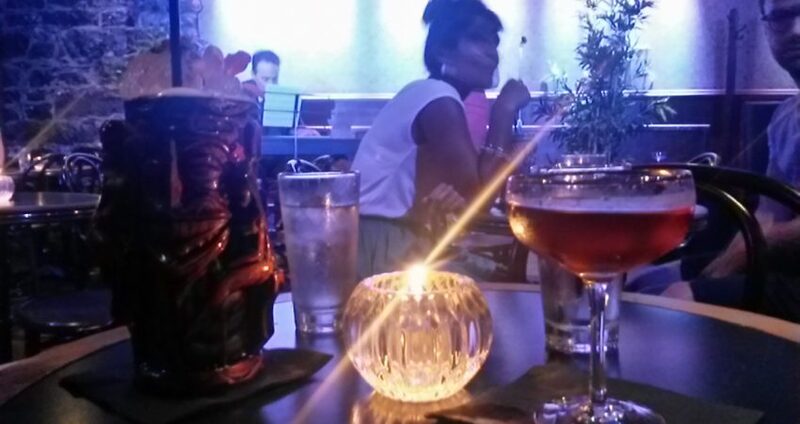 On my second visit, I ordered Une nuit à Rio (aged cachaça, sweet vermouth, maraschino, …), while my friend had a Black Panther, a Tiki drink made with gin, aloe vera liqueur, lime juice, eucalyptus syrup and pineapple puree. Two very different drinks from Dirty Diana’s list but both equally delicious. Indeed, I’m usually not much for “sweet”, fruity, Tiki style cocktails but I liked this one very much. It was fresh and sweet but not overtly so. A table next to us ordered one of the punches and my friend and I were impressed by its presentation in a wooden chest. As I said, I visited Le 4e Mur twice, which obviously means I enjoyed it a lot. So much so in fact that when my return flight was cancelled the next day I contemplated the idea of being rescheduled 24 hours later to enjoy an extra night in Montreal, visit some bars I hadn’t had the opportunity to visit and go back to Le 4e Mur. A bit crazy but that’s me. The guys have done a seriously brilliant job with the bar. 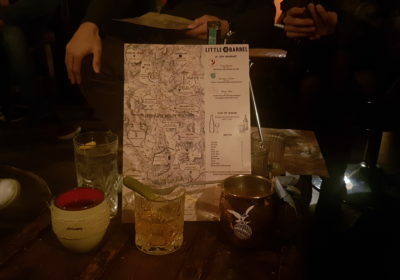 The whole speakeasy concept has been really well thought through and, a little over a year after the bar opened, you’ll still be hard press to find its address leaked online. It goes to show how guests have taken to the “secret” concept and abide by it. The atmosphere was relaxed, the music nice and not too loud, people extremely friendly and the drinks extremely tasty. I simply had a great time. I’m thinking of going back to Montreal next year. If I do, you can be sure a visit to Le 4e Mur will be on my agenda.